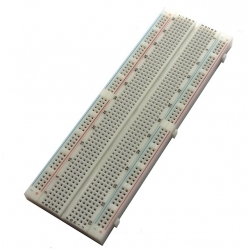 This 6.5" x 2.125" breadboard has four bus lines spanning the length of the board and 63 rows of pins, enough for up to nine 14-pin DIP ICs or seven 16-pin DIP ICs. The rows and columns of tie points are conveniently labeled, and multiplte units can be connected for larger projects. Breadboards are commonly used for prototyping because they allow you to quickly build temporary circuits without soldering. Breadboards accept most through-hole parts and up to #22 wire. When you’re done or want to change your circuit, it’s easy to take your circuit apart. For best results, use solid wires when breadboarding; you’ll find pre-cut jumper wire kits especially convenient.